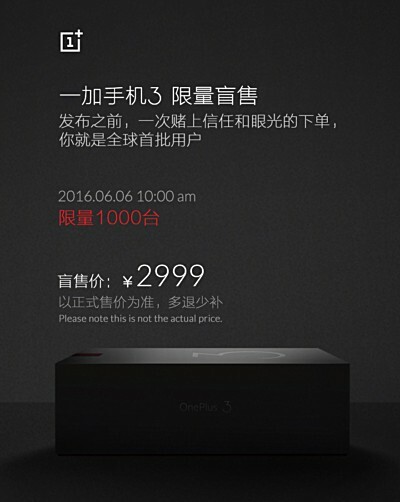 OnePlus has announced that a total of 1,000 units of its upcoming OnePlus 3 smartphone will be up for grabs on June 6 (coming Monday) in China. That's just over a week before the device is scheduled to be officially unveiled. So, does that mean some people will be able to get their hands on the phone even before it's officially unveiled? Well, no, as the orders will begin shipping on the announcement day itself. As for the price, the company says these limited units will be available for RMB 2,999 each (around $455). However, interestingly, this is not the final price. The actual cost of the handset will be revealed on the announcement day, and if it turns out to be less, you'll be paid the difference. But if it turns out to be more than RMB 2,999, you'll have to pay the difference. Thankfully, you'll have the option to pull out of the transaction if the difference is unacceptable to you. A time window of 7 working days will be there for you to make this decision. 450$ for china product ??? 455000 $ in one minute or less for nothing, Just the trademark. Interesting.